The Pegassus is silly, really. 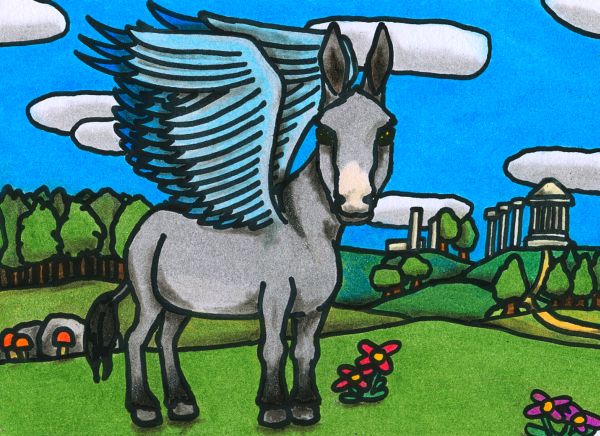 It’s not as graceful as the real Pegasus, not as cute as a winged gerbil. It can fly, but it will never be taken for a bird or a messenger of the gods. And the sounds it produces, well, they will never inspire the poets, though they might inspire the satirists. Not even in the legends is there space for such a silly creature – it has no place amongst the shining heroes and wretched villains of the past. Not that it gets along very well with either kind; the Pegassus doesn’t like to be told what to do, especially when obedience means running face-first into pointy danger for the glory of its rider. The Pegassus isn’t uncultured. It loves the harp and the flute, the sound of song and poetry performed – as such things should be – on an open field. It even likes the occasional theatrical performance, though if prefers the classics to the moderns. Yet the Pegassus does not live solely for art. It finds equal joy in hay, or carrots, or biscuits. It does not underestimate the pleasure of shade and cold water on a hot day, and knows very well that not being covered in flies is something to be grateful for. And while it will never claim to be living life for the purpose of discovering the higher truths, it does like to sit under the stars with its friends and ruminate about our place in the universe. The Pegassus has had a hard life. It’s worked on the fields, carried refugees, hauled supplies. Some say it’s lazy, but just because it’s not as suicidally stupid as a horse that doesn’t mean it doesn’t know what’s right. It just happens to have a very good idea of what isn’t. The Pegassus is many things, but it is not a slave. Perhaps no-one will ever write an epic about the Pegassus. No-one will praise it as they praised the magnificent creatures of the Golden Age. But unlike them, unlike the varnished shields of the heroes and the glorious manes of their steeds, the Pegassus endures. Its braying laughter will be heard in the hills when all the names of all the heroes have been forgotten. This entry in the Oneiropolis Compendium was made possible by Linda Hess, who laughs a lot but not like a donkey.